I had a feeling that the pig video would be a big hit, it is at our house anyways. We watch it over and over and laugh and laugh. The part we laugh at the hardest? When Jocelyn makes the funny face at the very end...cracks us up! 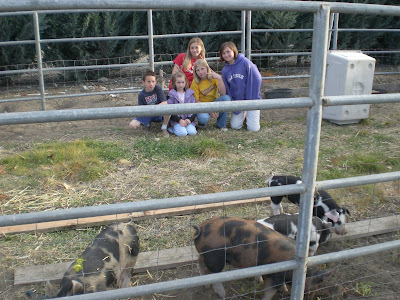 I failed to mention in yesterday's post that Ethan will also be taking a pig to fair, that is why there are four pigs, so that there is one spare, just in case. Ethan is 9 and barely weighs 50 pounds so it will be very very interesting to see how he can handle a 300 pound pig. We'll see! And for you and Lucas, I will do my best at granting his request. I will try to post as many pig videos as I possibly can. I'm sure there will be many video worthy incidents along the way. I think I overheard Shirley (my MIL) mention that we needed to weigh the pigs. That should be interesting! Anyways, today I've got some new music suggestions for you. Mostly they are just odds and ends. But they're good. 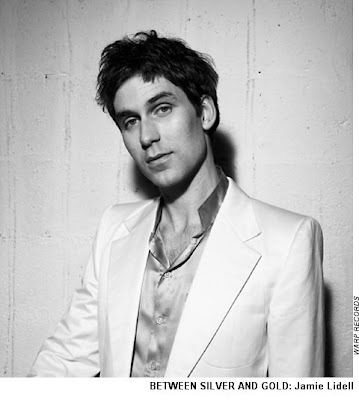 First, is this new single from Jamie Lidell, "Little Bit of Feel Good." And that is exactly what it is, a feel good song. I love to listen to this as I do my walk/run, because it just makes me want to move. Next, is Elliot Smith's, "Everything Means Nothing to Me." This is one of those beautiful songs that once I hear it, I just cannot get it out of my head. The lyrics are abstract, and so I'm not exactly sure what the song is about, but I love the piano work in the song. It's gorgeous! I couldn't find a music code for this next artist, but a couple of her songs have been getting a ton of play time on my iPod. Her name is Lex Land, she's an indie folk artist and she's probably labeled as strange. But, I like her voice, especially on the songs "As Much As You Lead", and "Play in Reverse." You can check out her music at iTunes. Pure delight is what overcomes me when I find a new artist doing jazzy standards. I recently discovered Rosey and her new album "Luckiest Girl." It's that kind of bluesy jazz that makes you want to sit back and relax as you sip a lemonade. My favorite songs from the album are "Remember", "Luckiest Girl", "Who Am I", and "It's Easier on Me." Finally, the free single this week at iTunes is a pretty good one, especially if you like jazz. The single is "Worrisome Heart" by Melody Gardot. Go and get it, it's free until next Tuesday.